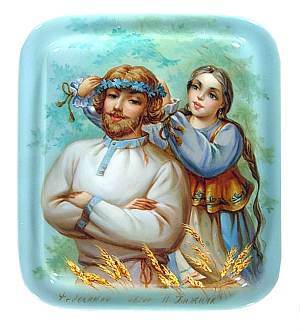 A young man feigns disinterest as his female companion places a wreath of cornflowers on his head, but his amused expression, and sidelong glance give him away. 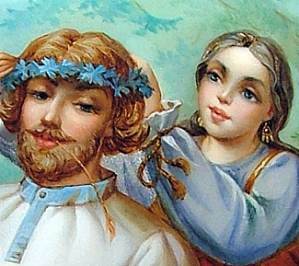 According to folklore, cornflowers worn by a man will tell if his love is true, based on how quickly they fade. Perhaps he is pleased that his companion is sure enough of her feelings to test the superstition, The soft blues and greens of the background echo the shimmering mother of pearl inlay of the maiden's blouse, while contrasting beautifully with the gold foil underlay of the softly nodding wheat. 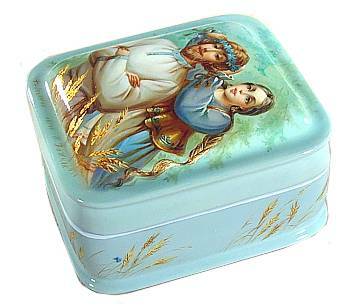 The body of the box is a unique sky blue, ornamented with more golden wheat interspersed with tiny blue cornflowers along the sides. This box is made of high quality papier mache, and is signed on the lid with the artist's name (N. Khizhnyak) and village. There is a huge on the left, and the interior is light blue. The base of this piece is flush. A real jewel!